Everyone once in a while we are treated to a dominating performance by one player in the tournament. Windham witnessed first-hand one of those performances. 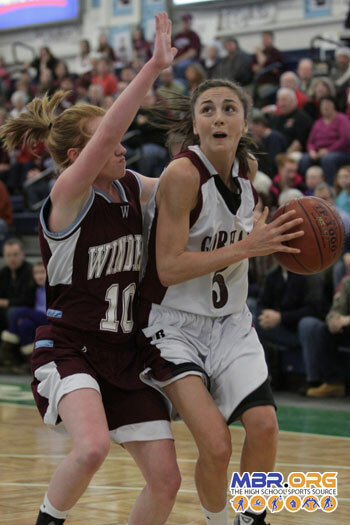 Mia Rapolla scored 37 points, outscoring Windham on her own, as Gorham advanced to the semifinals with a 54-33 win. Rapolla got off to a hot start, scoring the games' first 7 points. She would score the first 13 for Gorham, as the Rams held a 21-11 lead after the first quarter. Meghan Gribbin had 8 for Windham. Windham closed the deficit to 5 after baskets by Gina Cirillo and Stephanie Frost. Gorham went cold for much of the quarter. Rapolla and Gribbin traded 3-pointers late, and Gorham went into halftime with a 30-21 lead. Rapolla put the game out of reach early, hitting three 3-pointers in the first two minutes of the half. Those nine points would equal Windham's output as a team, pushing Gorham's lead to 46-30 heading into the fourth quarter. Neither team could find the basket to start the fourth quarter. Windham struggled to find any sort of offense and ran out of gas, only managing to score on a Gribbin 3-pointer as Gorham prevailed in this one. The Rams move on to the semifinals at the Cumberland County Civic Center.